This easy homemade lemon meringue pie is delightfully tart and sweet. 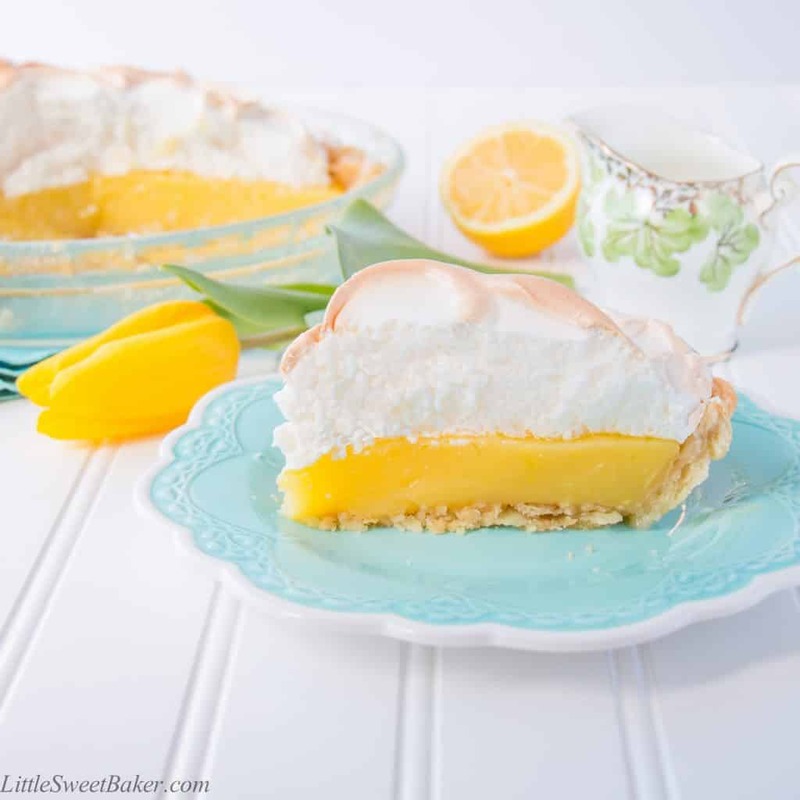 It’s vibrant and bursting with a lovely fresh lemon flavor and topped with a billowy cloud of toasted meringue. It’s officially Spring here in Ontario and to celebrate the warmer weather that’s coming, I wanted to bake something that was bright, light and fresh. 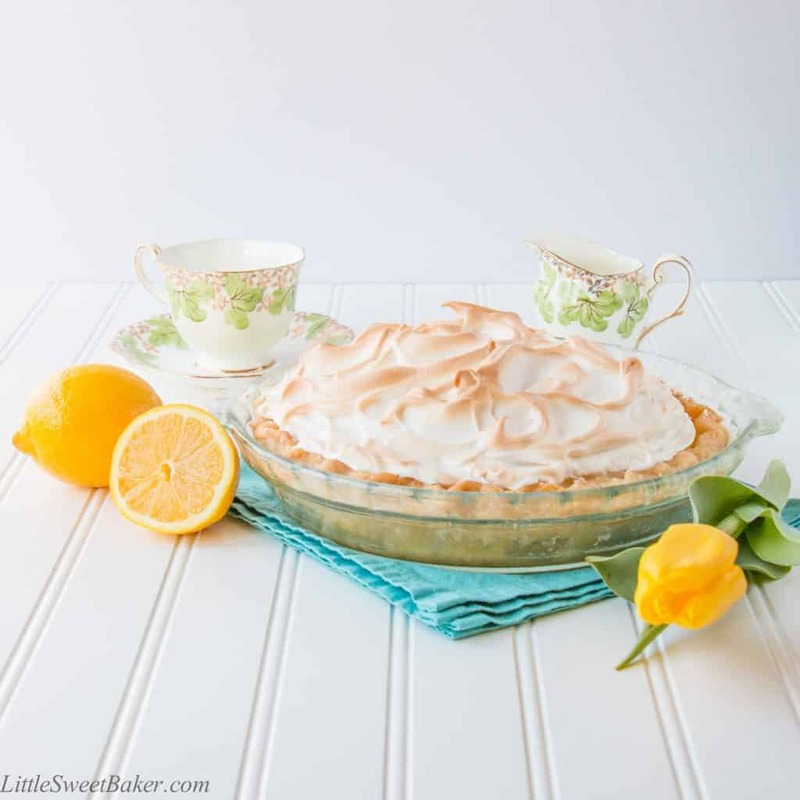 What better dessert that fits that description than a classic lemon meringue pie. To me, a good lemon meringue pie is like a slice of sunshine. This recipe starts with my 4-ingredient flaky pie crust that comes together in minutes. 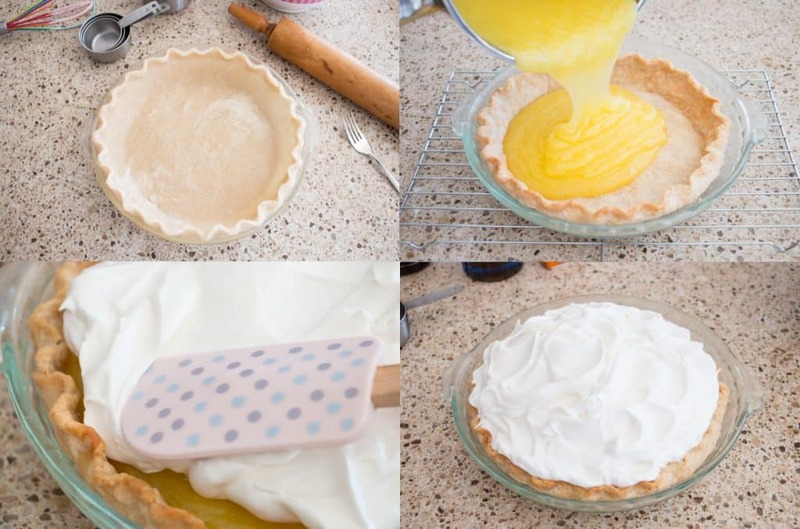 You blind bake the pie shell and while it cools, you work on the lemon filling. The luscious lemon filling is just 5 ingredients. 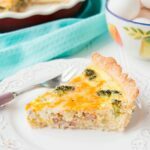 There is no tempering of the egg yolks; you just whisk everything together, cook until it thickens and pour it over the crust. The meringue is simply egg whites, cream of tartar, sugar and a dash of vanilla. 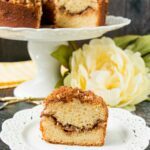 You whip that until glossy and stiff, spoon it over the filling, toast it in the oven until golden, and voila! A beautiful and bright freshly baked pie. 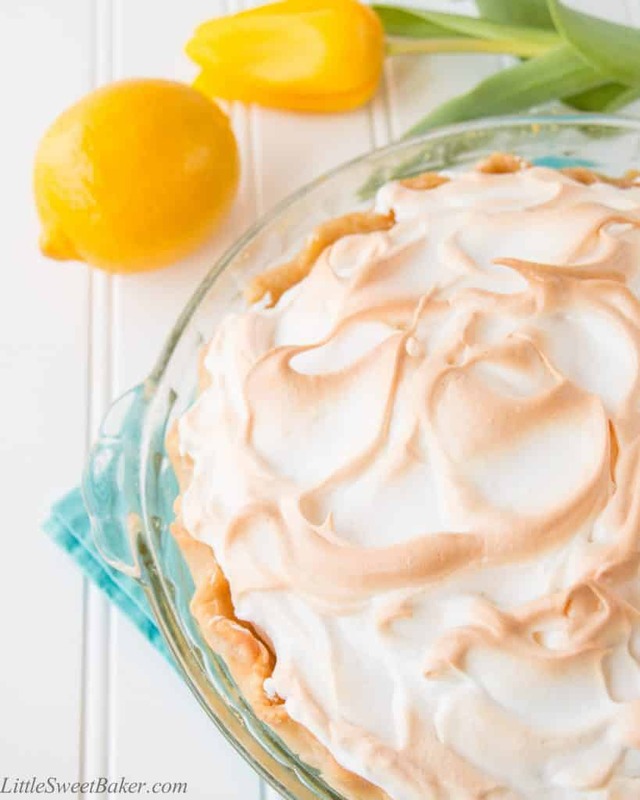 The flavor of this lemon meringue pie is bold, zesty, tangy and sweet. The addition of vanilla to the meringue adds a marshmallowy candy-like taste to it. The texture of the meringue is soft and airy. The lemon filling is smooth and luscious. The pie is all held together by a tender and flaky crust. Preheat oven to 425F and set aside a 9″ pie plate. Roll out between 2 sheets of wax paper. Remove the top sheet of wax paper. Use the bottom sheet to lift and flip the dough onto the pie plate. Fit the crust onto the plate and finish the edges as desired. Poke the bottom of the crust in several places with the tines of a fork. Bake for 15-20 min or until golden brown. Place on wire rack to cool and reduce oven to 325F. Mix sugar with cornstarch in a 2-qt saucepan. Whisk in the water, yolks and lemon juice. Bring to a gentle boil while constantly stirring with the whisk. Continue to stir for about a minute, until translucent and thick. Remove from heat; stir in zest and butter until butter melts. Pour into crust. Beat egg whites and cream of tartar in a large bowl on low speed until soft peaks form. Add in the vanilla and increase speed to medium-high. Slowly add in the sugar, 1 tablespoon at a time. Beat just until glossy and stiff peaks form. Spoon on top of filling and spread around the edges making sure to touch the crust. This will prevent the meringue from shrinking. Spread and mound the rest of the meringue in the center to create a dome. Swirl the meringue using the back of a spoon. Bake at 325F for 20-25 minutes or until golden brown. Cool to room temperature, then refrigerate for a minimum of 2 hours to firm up. Best served the day of. Leftovers can be stored in the refrigerator for up to 1-2 days.